Saorla O’Dowd is a 23-year old aspiring writer who has just graduated from Trinity College with a BA in English Literature and Drama Studies. Part-time popcorn scooper and full-time procrastinator, she enjoys fanfiction, Feminism and finding time for alliteration. She also hopes to one day receive her Hogwarts letter, as it has clearly been lost in the post. I was never really a fan of geology. Whoever came up with the phrase “geology rocks” was a bit of a sadist, at least in my opinion; coaxing you into believing that staring at various lumps of granite is more interesting than it sounds. Still, one thing that stuck with me during that one year I studied college science – aside from all the super cool dinosaur stuff – was how the life of a star ends. We all know what stars are – those tiny glowing balls of energy and matter you can see from your back garden, millions of light years away here on Earth. We look up at the night sky and think how beautiful they are. How very different from us mere mortals and our tiny lives. But in reality, we’re not that dissimilar at all; stars are as alive as you and I. (Well okay, not exactly like you and I, but we’re made up of the same stuff – you see where I’m going here). And despite their putative eternal status, they don’t just stay up in the sky forever for us to stare at; they, too, must succumb to time and oblivion. They die, just like us: a phenomenon known as a Supernova. The orb in question is pretty much sitting there in outer space, minding its own business, when suddenly BAM! its core collapses! Energy is released which shatters the star from the inside out, blowing it to smithereens, which are then flung into the surrounding area. And with a flash, something that was once so solid, so present, is gone forever. To wind down a very rambling metaphor, that’s what graduating college has felt like for me. One big supernova. It’s been approximately 40 days since I moved back home, and I’m feeling very like Jesus in the wilderness. Since the moment I handed back my apartment keys, I have lost my roomie/confidante to emigration, returned to my job as popcorn scooper at the local cinema, and broken up with my boyfriend. In short, my life appears to have supernova-ed. But it’s not a big deal, right? After all, nothing is set in stone (geddit? ); life is a variable, not a constant. We change relationships, houses, countries; we change hairstyles and diets and cars. We tell ourselves that we’ll be fine, we can handle it. We’re creatures of habit and structure: just give us a plan and we’ll stick to it. Even if it isn’t what we really want. Well, I don’t have a plan. Not anymore. A fact that is both liberating and terrifying with a capital T. Ever since I was four years of age there was always a plan – one which I generally had no say in: go to school every day (excepting holidays), go practically brain-dead after the Leaving Cert., and then go on to college. But now? Now I’m supposedly a grown-up and can decide grown-up stuff for myself. I guess I do look like one; a grown-up that is. I mean, I rarely get ID’d anymore, and got called “ma’am” on the bus one day by the driver (WTF bus man – I’m only 23?). I know I’ve apparently got one of those demeanours that makes me seem much older, but since I can’t yet pass for a pensioner and snag myself a free travel pass, I’m not feeling overly positive about my supposed ‘wise’ aura. Especially as it deceives others into thinking that I know what I want to do with my life. Here’s the truth: I don’t. And I still feel like a self-conscious teenage dirtbag, baby. Who am I? What should I do? But more importantly: what do other people expect me to do? In fact, nothing in my 23-year long plan has prepared me for the reality of being me. I’ve been told many times who I should be, a person who often seems very much at odds with who I feel I really am. Because, to tell the truth: I’m a self-deprecating, pessimistic, procrastinating perfectionist who’s still trying to please everyone. Welcome to my Quarter Life Supernova. This entry was posted in Quarter Life Bloggers and tagged broke up with boyfriend, no plan, self conscious, supposed to be a grown up, teenage dirtbag, unprepared, what do I want?, who am I? on July 22, 2014 by admin. I found this blog post in my old files! I’d written it over 3 years ago but I thought it was still relevant so wanted to share it with you now! I watched Alice in Wonderland with Johnny Depp during the week. I’d seen it once before, but this time around one particular scene really caught my attention. The Mad Hatter is talking to Alice and telling her that the last time she visited Wonderland, she was “much muchier” and now she seemed to have lost her “muchness.” I was intrigued. 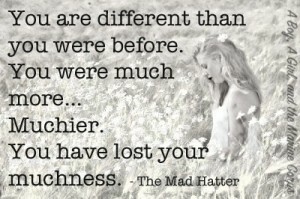 Muchness is defined as “greatness in quantity or degree.” What the Mad Hatter was saying in his own way was that Alice had lost some of who she used to be. Basically that she had forgotten who she truly was as she had grown up. I couldn’t believe I hadn’t picked up on that before. How many of you feel that we have lost some part of ourselves as we’ve grown up? How many of you, as kids, were kinda afraid to grow up because you believed you would become less of yourself? I was afraid that I would become a boring, careful person who followed the rules and thought it odd to walk barefoot in the grass. But guess what? I grew up and followed the rules and thought it odd of people who walked in the grass barefoot! I was thinking, ‘do they not realise the amount of dog crap there!’ I’ve been trying to reclaim my muchness for years now! When I think back to my childhood, I can see myself as exactly the same person yet at the same time, completely different. I feel quite lucky in the fact that I’ve always managed to keep some of my muchness, that childlike excitement, wonder and awe. However the bold fearlessness, perhaps ‘muchiness’ is something which I feel I’ve lost a lot of. I was skiing earlier this year (2011!) and I had been really looking forward to it. I had been once before when I was younger and back then, on the first day, I had skied down the mountain with my older (but still very young) cousin. It was exhilarating and wild. I don’t know about you, but I really don’t want to lose my muchness. I feel like it’s a huge part of me and that I have already lost enough of it. I find it scary that we lose a huge part of who we are, simply by growing older. I understand that we are going to grow up and there’s nothing that we can do about the passing of time however just because we grow older it doesn’t mean that we have to lose sight of who we used to be. Many of my clients often find their true passions and strengths when they remember who they truly are. So, today I invite you to embrace and reclaim your muchness! 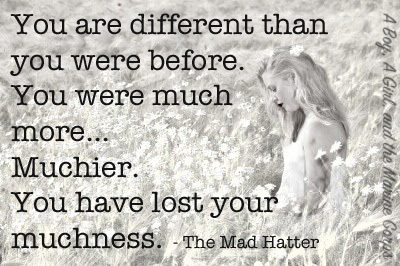 Take some time to figure out what your muchness is and whether you’ve lost the essence of who you are as you grew up. When you get down the essence of who you were — the heart of who you thought you would be — what do you come up with? What of that essence have you lost? Contemplate the following questions and I’d love to hear your stories..
Did I stop doing those things and why? Some people continue to do the things they loved to do as kids however most of us have stopped. Think about what you did as a kid and ask yourself why you still do it or why you have stopped? Who did I think I would be when I grew up? Allow yourself to be completely honest here because when you think about who you thought you would be, you’ll learn about the things that were important to you as a kid. I know that some things may be a bit far-fetched, for example a Super Hero but… think about why you wanted to be that person? What did you think that would give you? Respect, Strength, Fitness. If you wanted to be a pilot, it could have been that you wanted to travel and see the world. How am I like my childhood ideal? Take some time to consider how you might actually be like your childhood ideal. You might not be exactly what you thought you would be, but you may be closer than you think. For example, I always wanted to be a published author which at the moment I’m not, but I do spend a lot of my time writing! How have my attitudes and beliefs changed? As we get older, it’s no surprise that some of the things we hold as important change. But think about how your beliefs may have changed since you were a kid. What attitudes did you have then that you may not have now? If you witnessed an injustice, as a child would you have spoken up? Would you now? The majority of individuals I work with are twenty-somethings and I believe a big reason why so many of us struggle in our twenties is because we have lost our muchness and it is incredibly frustrating. We can see what we want to do, be or have but we don’t the muchness to go after it. There’s something missing and we make the mistake of believing that it is something external but it’s not. Everything we need to fill the ‘emptiness’ or ‘the something missing’ is still within us, just hidden inside- we simply need to reclaim it! I hope you enjoyed this issue of Progress! Pop over to the facebook page and let me know if you feel you’ve lost your muchness and what you’re going to do to reclaim it! 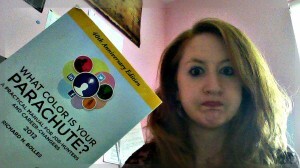 This entry was posted in Uncategorized and tagged alice in wonderland, courage, excitement, happy in your twenties, how do i know what i want?, how to feel happy, life coach dublin, life coach ireland, muchness, WHERE AM I GOING, who am I? on July 9, 2014 by admin. She is a smart woman, she found school interesting and fun yet she would never let on! She always enjoyed exams and tests because she was able to stay calm. She accepted that what she knew then would have to be enough and she felt empowered. She enjoyed that feeling as she felt special, everyone else seemed to be panicky and stressed. Part of her misses that school but again, she’d never let on! She gets an anxious feeling in her chest or around her heart every now and then, she’s not 100% sure what it is but it bothers her. It means that she knows she’s holding back from something- that there’s something that could be better but she’s too afraid to do something about it. She’s a very open and warm person and tries to see the best in everyone. Sometimes though, she can be played and people take advantage of her. She doesn’t like to be angry and feels guilty at the idea of hurting someone else’s feelings. She would rather take the hit herself than to hurt someone she cares about. This causes her to numb her feelings quite a lot. As a result, she tends not to really know what’s important to her or what she really wants. She’s quite open to other people’s influences and suggestions. She is curious and imaginative and loves new things, exploring, parades and gatherings of people. She loves having something to look forward to although she doesn’t allow herself to get excited until it’s actually happening. She has a bit of a short attention span and can get distracted easily. She will start new courses and projects, make big bold resolutions and then not follow through. She speaks to herself harshly, she is her own worst critic and her own worst enemy. She is a sensitive soul and she needs to be alone every now and then to soothe her soul and recharge. She will get upset if she doesn’t have a chance to do this and the only reason she won’t get the chance is because she is too harsh with herself. She will look forward to a massage or something special for herself and then she won’t allow herself to do it or have it because she doesn’t deserve it, she hasn’t earned it. In a relationship, she can be easily taken advantage of as she would never want to hurt someone she cares about and if her partner knows this, he/she can exploit that. She is very loyal and loving and will always try to help her partner as much as possible- often she would end up in a relationship with someone who needs a bit of help and support– a lost soul. She will always fight for the underdog and help make him top dog and it will be really hard for her when he turns and bites her. She is very low maintenance and easy going. She loves the little things in life and in a relationship, the little things are just as, if not more important than any grand gestures. She loves to feel she can talk to her partner about anything. She wants someone who will treat her with respect but she would never demand it. In work, she is really hard working. It is important that she feels authentic- it’s important that she knows what she is doing and feels confident. She suffers from imposter syndrome sometimes and is terrified that she will be caught out or that her boss or colleagues might find out that she doesn’t have the answer. Relationships in work are important and it is vital that she has respect for her colleagues and most importantly, she needs to respect and admire her boss. If she doesn’t, she will never feel comfortable or honest in her career. If she finds herself in a career or relationship that doesn’t ‘feel right’ for a long period of time but doesn’t do anything, her self esteem and confidence start to suffer. Her values start to get fuzzy as well as her sense of who she is and what she’s about. Because she’s a sensitive soul, not wanting to hurt anyone else, it will normally take a lot before she does anything to change her situation. She is me. I wrote this about myself a few years ago. If you’ve read up to this point, then I’m guessing she is you as well! I’m often asked what I do and who I work with. I work with her. I adore her. I work with her to help her find her own place in the world, to practice self love and self respect, to be real and authentic. I work with her to help her find her answers. To help her find meaningful work and loving supportive relationships. I help her to adore herself and be happy within herself. I’d love to hear if you resonated with this! I really would love to know if you know her? Please drop me a line to paula @ myquarterlifecoach.com or pop over to the facebook page and let me know! This entry was posted in Progress and tagged can i be happy?, dreams, growing up, happy in your twenties, imposter syndrome, life coach dublin, life coach ireland, Life Coaching, relationships in your 20s, self esteem, WHERE AM I GOING, who am I? on July 1, 2014 by admin.